It's day two in my Valentine's Day Countdown, and that means another chocolate recipe! This one is a tart filled with two types of luscious ganache, one of which contains hazelnut praline, and I decorated it with a hazelnut praline heart. Nutella addicts will love this! The base of the recipe is my chocolate pie crust. It is quick, easy, and very light and flaky. The key to a good pie crust is keeping everything cold, especially the butter. When the butter melts, it creates steam, which results in a flaky crust. Another tip is to handle the dough minimally. Rolling and kneading develops the gluten in the flour, making it tough and unappealing. 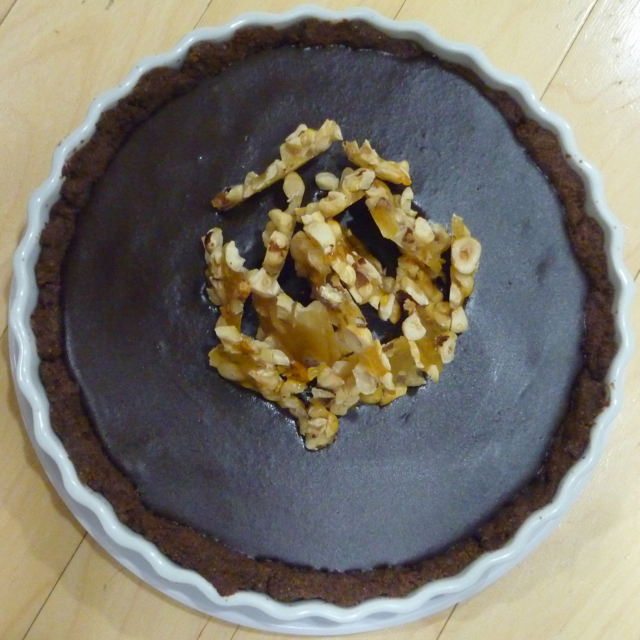 There are two types of ganache in this tart. One is fudgier and made with milk chocolate while the other is satiny and bittersweet. You can change the types of chocolate, but I recommend keeping the proportions of liquid the way they are to have different textures. Praline refers to caramel-coated nuts. How could this not be delicious? When you coat it in chocolate, it gets even better! I like to chop up some of the nuts before I drizzle them with caramel so that I can arrange them into a shape for the top (I made a heart for Valentine's Day! ), but I leave the rest whole so that the praline is cut into the mixture when I make the filling. I do not add cream to the caramel because that turns it into chewy candy or a sauce, depending on how much you add. When it's just sugar and water, it becomes brittle and fragmented. This is a great way to add texture to the tart. Pulse the flour, cocoa, 1/4 cup sugar, and salt in a food processor until combined. Add the butter and pulse until small pieces remain. Combine the egg yolk with a tablespoon of cold water and add in. Pulse until almost cohesive, adding more water as necessary. Chill. Heat oven to 375F. Grease a 9-11" tart pan. Roll the dough out to fit the prepared pan and prick with a fork. Grease a sheet of foil and press, greased-side down, onto the dough. Fill with pie weights or dried beans and bake for 25 minutes or until firm. Remove the foil and weights and bake for 5 minutes more or until cooked through. Chop 2oz nuts. Spread all of the nuts on a foil-lined tray, separating the whole and the chopped and arranging the chopped nuts into a shape, if desired. Combine the remaining sugar and 1/4 cup water in a small saucepan. Cook, stirring occasionally, until amber. Pour over the nuts and cool until hard. Chop the whole nuts. Heat 1/2 cup + 2T cream to a simmer in a small saucepan. Whisk in the milk chocolate and fold in the previously whole nuts. Spread the mixture into the cooled crust and chill until set, 1-2 hours. Combine the remaining cream and milk in a small saucepan and bring to a simmer. Add the chocolate chips and whisk until smooth. Spread over the milk chocolate praline and chill until set, about an hour. Top with the remaining praline.